But on reflection, this is, in a way, beside the point. Such thinking does not ward off forever the effects of these increases. Many people rely on toll roads to get to work each day. The fact that I don't use them only puts me at a slight advantage to those who need to use them. It is not in any way to my benefit though that other people are being disadvantaged in their daily struggle to feed their families and pay the mortgage. It is also beside the point as these increases are,unfortunately, only part of a progression. Tolls will go on increasing, as will power prices. Beside this, there will be more toll roads until I won't be able to avoid them. I also will be caught in their web. I can delay the impact but I can't avoid it. Where are we headed? Not only I will be caught but so will many others who hitherto have felt untouched by the imposed hardships on those less fortunate. There will be a cascade of those affected. 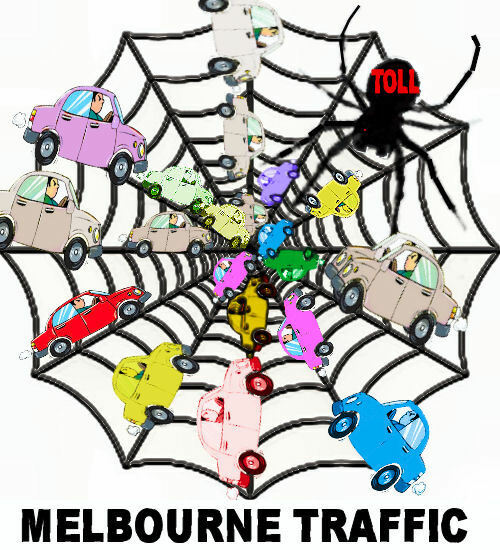 The tentacles of the owners of toll roads and power companies will eventually have most of us in their grip. After all, this is all about maintaining that ratio of the 1% as opposed to the 99% . Remember the "Occupy Movement"? Many people I know count themselves lucky, comparing themselves with those who are not as well off. They do not see themselves as affected by the rising inequality in Australia. This "glass half full" attitude is so much more socially approved of than mine, which compares my lot with both what it used to be and also what it could have been were it not for the 1%. To me "glass half full" attitude is a sort of misplaced Pollianna-ism and given what I believe from the trend I observe it is really a sort of "precipice complacency." It seems that all will be taken from those who don't own the means to extract from the majority. Those about to lose are those who now feel secure, even somewhat wealthy: those with superannuation, who have finally paid off their houses and look forward to a carefree retirement. Neither will things get easier for their overworked adult children, in turn trying give their children the best start they can in life. They all appear unaware, unsuspecting, that things will be taken from them by the system that once gave to them. In one lifetime - theirs - the "accumulation phase" will be over and the outgoings will be larger than the income. Most of us will be financially and time stressed. Our children will be hungry for work. Or just hungry. Our society is as a collection of frogs being slowly warmed to boiling point by a few big frogs who've got control of the frypan. We had better take the pan off them before the bubbles start to rise. Thanks Sally and I agree with your sentiments, we are being boiled alive as are those who are doing the boiling although they don't know that yet! We desperately need to find a better way, a better political framework, a better economic environment, a way in which we can live in harmony with the land. I'm currently reading George Monbiot's book "Out of the Wreckage", sub-titled "A New Politics for an Age of Crisis", which covers various aspects of the current diktat and explores what can be done by a true democracy in the future. While some of the ideology may seem a bit naive, the objective of the book is meritorious. WE do need to take control of the frying pan or we will literally be boiled alive!! I appreciate your comment and really would be interested to know what Monbiot suggests, since we can do with any advice. Did he mention the role of war in the international economy? I was once again shocked at the merciless economic immigration ideology coming from the EU President Junker when I received an email citing him in a Breitbart article from November last year. This is a man raised and politically groomed in the unreal environment of Tax-haven Luxembourg. See http://www.breitbart.com/london/2017/11/28/eu-president-without-millions-african-migrants-europe-lody/ Junker presides over a body that has gone along with brutal wars in the Middle East and Africa and grotesque austerity measures. He was Luxembourg's representative on the board of Governors of the World Bank. Such people are unable to see past the accumulation of personal fortunes. They will literally push any ideology that keeps that money coming. I see them as as radical and psychopathic, as removed from ordinary people, as Nazi commanders. Excuse me using your comment as a bouncing board for my rave here. I imagine that Monbiot does talk about the problem of very wealthy capitalists, does he? There are links forward and back to causes and solutions. At least he is trying. But reality seems to be that no matter how many books are written on the causes, problems and possible solutions, not much seems to change. The sticking point seems not be knowing what is wrong, or what to do about it, but rather making any change happen. Do you have any ideas on how to make change happen? Not being able to make change happen could be described as not knowing what is wrong or what to do about it, too. It all reminds me of the problems ordinary people have in trying to get our Flora and fauna guarantee act enforced; we do not have 'standing'. We do not have 'standing' in our own country to be represented. Citizens do not have standing here. They do not have standing even to say how many members the citizenry here should have. It's like being dictated to by the Catholic Church in the Middle ages. I don't think change can come from the system that benefits from the status quo - the Catholic church is perhaps a good example here - change from outside - from a grass roots movement started by mainly one man who tapped in to popular sentiment and people felt strongly enough about the issue to risk being killed (often by burning). Thus I feel a similar process will eventually happen now in relation to our current power system - only much worse, as we are now dependent on the system for all our food and other needs, whereas once this power was much more decentralised and democratically distributed. But I think it will be too late soon, if not already. Not too late for change, but too late to avoid massive suffering. Of course, Matthew, we published that, and there were no comments. Did you publish it elsewhere and get comments? So, you are proposing a way for citizens/residents to begin to create their own government. It is an excellent proposal. I tried to encourage people to do this when I suggested complaining to various authorities, including armed forces, of the way massive population growth was overturning our laws. I might go and post your article to a few groups now. Thanks Sheila - yes you did support that idea when I published it. There were a few comments here. Ah, yes, the AIM network .. cough cough.. :-) (which, sadly, is full of defenders of Soros which presumably means they are financed by him). I'm glad you got some comments. So, there is obviously nothing wrong with your idea. People have to choose to dedicate themselves to it. When I think of the number of organisations I am mixed up with and how hard it is to get anyone to actually look after them. It needs publicity and something for people who don't read, such as a youtube rundown. I looked on youtube and there was nothing like it. Please try to continue to promote this. It is the best idea I have heard. Thanks for your encouragement Sheila, I will see if I can do something to promote it a bit more. Youtube seems one likely possibility. This is just the latest symptom of a system that is fundamentally unsustainable. And I would argue, almost unrecoverable. Our reliance on fossil fuels is the root of all this (and switching to batteries will not help). Fossil fuels underlie the sprawling separation of work and home, allowing services to be centralised and concentrating us around city centres. Fossil fuels allow our unsustainable food and transportation systems, which will persist even in the face of global warming, as more energy is bought to bear, until a horrible climax is reached. What is the solution? Not something that anyone, or any government is likely to do. That is to move back to localised systems, wean ourselves off fossil fuels. This would require a massive, carefully orchestrated effort by everyone. And much sacrifice by all. An effort akin to that put into preparing and winning a world war would be needed, and is needed. But a rallying of the troops for this war is a very unlikely event. Most people are either oblivious to the problem, or prefer to pretend it doesn't exist. But more and more people will become marginal participants in the system as their poverty increases. Yesterday I heard someone talking on radio ABC Melbourne about an outbreak of Dyptheria in Jakarta along with the observation that the disease is more likely to spread due to the dense population in that city. There was not a hint of irony at all in the report or reference to Melbourne being in the process of emulating these levels of density! !